As a small business owner, you have a lot to keep track of, from the smallest details, like spell checking emails and web content, to the biggest—your company’s vision. With so much to check off your to-do list each day, it can be very easy to spend hours at a time on small—though important—tasks, foregoing the essential work of putting your concepts into action and solidifying your vision. 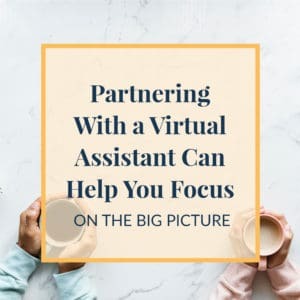 Partnering with a virtual assistant with specialized skills and experience will ensure that everything on your list gets done quickly and professionally, allowing you to focus on the bigger picture and move your business forward more quickly. The following are a few key areas you may want to consider partnering with a virtual assistant on. As the business owner, there are certainly times when you are the only person a client wants or needs to speak to—when closing a sale or finalizing the details of a new business partnership, for example. Handing over all of your other day-to-day client correspondence to a virtual assistant will save you a ton of time and money. Because most businesses have a 24-48 hour follow-up window at most, clients expect prompt replies to their inquiries and requests. By handing off email responses, follow-up calls, prospect calls, and informational correspondence, you’ll save yourself from getting caught up in hours of work that can be easily done by a virtual assistant who knows your product and business and can simply convey information. Because this will be one of, if not the main function of your assistant, she may offer clients a more focused, personalized experience because she won’t be thinking about the 46 things that have to get done after the call. Partnering with a VA ensures everything gets done–and done well–so you can focus on growth. As any entrepreneur or manager can attest to, administrative tasks are endless. Administrative work is never finished and can drain the energy and creativity that should be reserved for developing your business strategically. Additionally, because many administrative tasks involve knowledge of software systems and specific skills, hiring a virtual assistant will save you time because you won’t be required to learn every new task, system, and program that is required to run your business. We offer administrative support with voice message creation and implementation, editing and proofreading, Microsoft Office programs and tasks, document and manual creation, and website maintenance, among other things (see a more inclusive list here). Hiring a virtual assistant for special and temporary projects is also a great way to save your energy and get projects off the ground faster. Virtual assistants can offer clients a focused, personal experience. These days, a strong social networking presence is a must if you want your business to be successful. This means writing and posting blog articles to social media, adding visual elements to your social presence, linking to other sites and articles related to your business, and maintaining an engaged daily presence online. As with the other daily tasks we discussed, however, it’s very easy to get distracted and waste time while posting on Facebook, Twitter, and other social sites. To ensure that you stay engaged with your prospects and clients without getting sucked in, ask a virtual assistant with experience in social media management to compose content for your blog and social media sites that are relevant, quality, and engaging (see our article on content marketing essentials for tips). He or she will likely create a block of posts at a time and schedule them strategically so that they automatically post on your social media sites during times that your clients are most likely to see them. Setting yourself up with a virtual social media assistant will, again, save you time and money while moving your business forward more quickly and strategically.